To request an inspection and free insulation estimate, call LeafGuard by Midlands Home Solutions at 1-844-807-6136 or click below! We are your local contractor for high-quality cellulose insulation in Omaha, Lincoln, Council Bluffs and surrounding areas of Nebraska & Iowa. Get a FREE Cellulose Insulation Quote Today! What makes our cellulose insulation in Omaha & Council Bluffs "greener" than others? If you have an uncomfortable home or rising utility costs, call the insulation experts at LeafGuard by Midlands Home Solutions today. Our home insulation experts will provide you with the quality solutions you need to ensure that your home is as comfortable and energy efficient as possible. Call us today at 1-844-807-6136 to schedule your home insulation inspection and free estimate. 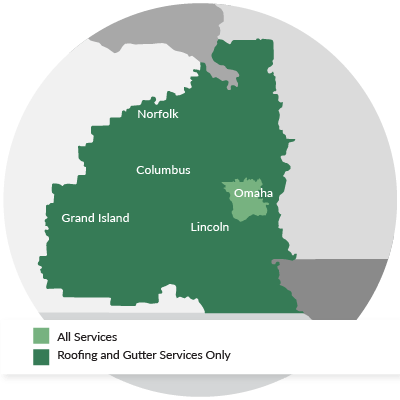 We proudly serve Sioux City, Bellevue, Grand Island, Kearney, Fremont, Hastings, La Vista and surrounding areas.